Blue Mountains National Park is a great place to visit. 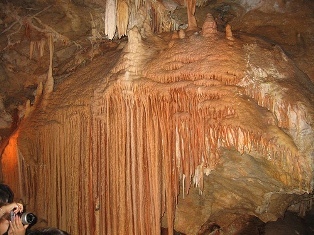 It is the most famous and most visited national park in New South Wales. Sydneysiders have been spending their weekends here for the last century and international tourists visiting Sydney often visit it as the only national park in Australia. Nothing wrong with that – Blue Mountains is known for its rock formations, blue gums and wildlife like laughing kookaburras, common wombats and superb lyrebirds. And, it’s only 60km from the central Sydney – easily done on a day trip. Wentworth Falls. Poster by AllPosters. Click on thumbnail to buy. Visiting Sydney and want to take a tour out to the Blue Mountains National Park? Here are some tours that are available. You can see the ratings made by other visitors, click on each tour for more detailed information, and make safe and simple bookings. The park is full of interesting wildlife. Eastern grey kangaroos, wallabies, wombats, possums, and gliders are commonly seen. Birds include King parrots, Crimson rosellas, superb lyrebirds, laughing kookaburras and gang-gang cockatoos. Most birds and animals hide in the middle of day but are easiest seen in dusk and dawn when they become more active. Winters can get very cold in Blue Mountains, much colder than on the coastal lowlands, and snow is not unknown during the winter when it can be too cold to camp. Greaves Creek. Poster by AllPosters. Click on thumbnail to buy. Blue Mountains National Park is huge – it surrounds many small towns along the Great Western Highway. Whether you catch the twice-hourly train from Sydney’s central station, or drive a car, the national park starts in Glenbrook. Keep driving and you come to Faulconbridge – a small town with the Norman Lindsay Gallery and Museum, the former home of the famous Australian artist and author. Blue Mountains have always been an artists’ hideaway because of its proximity to Sydney, laid-back atmosphere and beautiful scenery. Three Sisters. Poster by AllPosters. Click on thumbnail to buy. After you pass the 300m Wentworth Falls south of the highway, you come to Katoomba. 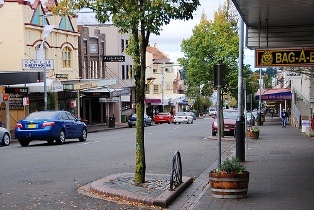 Katoomba is the centre of Blue Mountains’ artists community. With its Art Deco cafes and guesthouses and views of the famous rock formations within walking distance, Katoomba is a great place to stay while discovering the national park. Three Sisters, the most famous of the rock formations, can be seen across Jamison Valley from Echo Point just south of the town. To make the most of the views, there are the Scenic Railway, Scenic Skyway and the Cable Way, which crosses the Jamison Valley and stops for photo opportunities. Bushwalking is excellent around Katoomba and there are many short walks in Jamison Valley. * As in many other cool mountain villages, you can stay in cosy cottages: Bodhi Cottages. * Hotels and motels include Hotel Blue, Hotel Gearin, Carrington Hotel, Echoes Botique Hotel, Three Sisters Motel, Best Western Alpine Motor Inn, Blue Mountains G'Day Motel, Blue Mountains Heritage Motel, Town Centre Motel, La Maison Hotel, Mountain Heritage Hotel, Palais Royale Hotel, and Three Explorers Motel. * And there are even resorts, villas and apartments: Lilianfels Resort, Crimson Villas, and Blue View Apartments. Further north is Blackheath – a great base while bushwalking in Grose and Megalong Valleys. In the Grose Valley east of the town are short walks to Evan’s Lookout, Govetts Leap, Pulpit Rock and Perry’s Lookdown. In the Meadow Valley in west are short walks to Meldow Bath, Hargreaves Lookout and Mount Blackheath. You can camp at Acacia Flat and Perry’s Lookdown in Grose Valley, or you can stay at Tails of Blackheath Guest House, Glenella Guesthouse, High Mountains Motor Inn, Jemby Rinjah Eco Lodge, Parklands Country Garden Lodge, St Mounts Quality Inn or Redleaf Resort in Blackheath. Govett's Leap. Poster by AllPosters. Click on thumbnail to buy. For keener bushwalkers there is the three-day bushwalk from Katoomba to Jenolan Caves - it is a great walk, and not too hard. For a scenic drive, try the northern road between Richmond and Lithgow. Here's a map of Blue Mountains National Park, where I have tagged the places mentioned on this page. You can click on the tags to see what places they are, and double-click anywhere on the map to zoom it in and see the places closer. Drag the map to move around, and if you want to see the satellite image with Google Earth, click on "Sat" in the top right hand corner.